Swimming with the tide: migration behaviour of European silver eel in the Schelde Estuary. The Belgian acoustic tracking network in the Schelde Estuary reveals for the first time that silver European eels use selective tidal stream transport to migrate in a bioenergetic efficient way to the sea for spawning. Selective tidal stream transport (STST) is an efficient way for fish to use strong tidal currents to their advantage. Preserving vital energy, they go up in the water column when the tide is going their favoured direction, but descend to the bottom during the opposite tide. Such energy savings can be critical for diadromous fish, migrating across substantial distances between freshwater and marine environments. 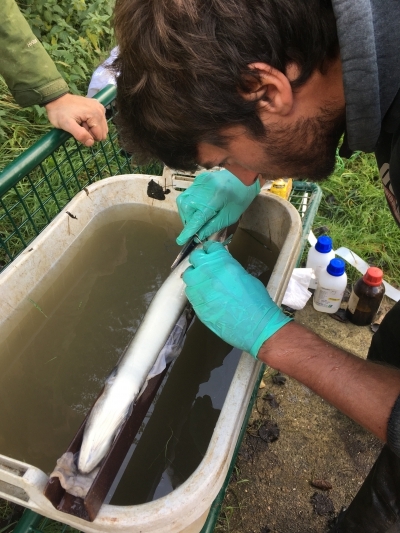 Tracking the critically endangered European eel on the Belgian LifeWatch fish acoustic receiver network revealed that STST occurs in the silver eel stage in the Schelde Estuary, during their journey to the Sargasso Sea to spawn. Studying silver eel movement behaviour in the Schelde Estuary, the recent publication of Verhelst et al. is the first to unambiguously expose STST of European silver eels. These eels were tagged with electronic transmitters, emitting a unique acoustic signal. After release, these tagged eels were detected by the receivers of the LifeWatch acoustic tracking network. The study showed that eels mainly migrated during ebbing tide, hence, they use STST to migrate in an energetically efficient way through the estuary as they make their way to the sea. Moreover, this also demonstrates that eels are able to distinguish between tides and can use them in some way for orientation, in addition to water flow. These results underline the importance of tidal dynamics in estuaries for the migration behaviour of the endangered European eel. Read the full article on IMIS. Want to know more about this research? Learn more about the LifeWatch fish acoustic receiver network and how it is used in Pieterjan Verhelst’s PhD research on fish migration. Implanting an acoustic tag in a European silver eel.